Welcome to the Meissen Collector, a web site dedicated to providing information to Meissen porcelain enthusiasts, collectors, and those who are attempting to identify, buy, sell, appraise or authenticate Meissen porcelain. Nearly 800 photos of Meissen figures arranged by category provide a means for identifying models. 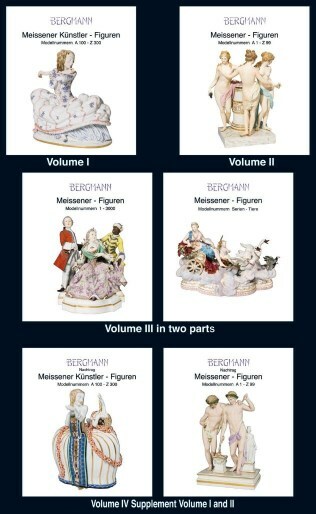 Detailed information can be found on a page dedicated to each Meissen model illustrated. Help make this web site a better reference for all users by identifying any errors found and report these to us. Search for unknown models by looking through the categories in the folders at the left. If the model number is known then look for it in the links at the bottom of the page. Some models numbers were used more than once in various categories. If you have Meissen porcelain figures that have been difficult to identify, the Meissen Collector will be happy to help if you e-mail a photo. Enjoy the web site, and let us know if you have any suggestions. Click on the picture below for information about several wonderful books no collector should be without! Meissen Model Numbers: 1, 10, 101, 1028, 1059, 1068, 11, 1122 - 1123, 1129, 1130, 1133, 113x, 12, 1220, 1230, 1239, 1285, 1290, 1293, 13, 1321, 1347, 1352, 1390, 1398, 14, 1408, 1416, 1436, 1439, 15, 155, 1566, 1584, 16, 1635, 1643, 1657, 1663, 1685, 1686, 1688, 1690, 1696, 17, 1710, 1711, 1715, 1717, 1720, 1776, 1778, 1787, 179, 1795, 18, 187, 1898, 19, 1919, 1963, 2, 20, 2020, 2073, 21, 2127, 2163, 2165, 22, 2202, 2204, 2215, 2219, 2223, 2256, 2262, 2264, 2265, 227, 2278, 2281, 23, 2342, 2344, 2346, 2371, 2399, 24, 2402, 2453, 2462, 2464, 2489, 2490, 2495, 2499, 25, 2502, 2550, 2558, 2559, 2562, 2565, 2568, 2571, 2577, 26, 2635, 2647, 2654, 2656, 2657, 2685, 2697, 27, 2717, 2723, 2724, 2728, 2730, 2732, 2748, 28, 2814, 282, 2868, 2869, 2897, 29, 2902, 2903, 2904, 2905, 2919, 2933, 2940, 2942, 2944, 2946, 2973, 2980, 2983, 2986, 2990, 2991, 2996, 2997, 3, 3013, 3024, 32, 34, 35, 36, 37, 38, 380, 433, 438, 440, 443, 447, 5, 530, 55, 575, 59, 6, 616, 62 A B, 62 A, 62 B, 63x, 656, 7, 720, 792, 798, 8, 812, 820x, 864, 870, 9, 904x, 965, 974, A 12, A 41, A 43, A 44, A 46, A 48, A 5, A 56, A 58, A 64, A 65, A 67, A 69, A 71, A 84, B 24, B 50, B 80, B 87, B 94, C 100, C 17, C 28, C 40, C 43, C 44, C 46, C 59, C 62, C 64, C 65, C 68, C 69, C 72, C 79, C 82, C 83, C 84, C 91, C 92, C 94 and C 96, C 97, C 98, D 1, D 11, D 13, D 19, D 2, D 4, D 48, D 66, D 92, D 93, D 94, D 95, E 1, E 11, E 12, E 13, E 177, E 2, E 26, E 28, E 3, E 4, E 5, E 58, E 65, E 66, E 69, E 70, E 71, E 76, E 77, E 82, E 9, E 94, E 95, F 1, F 10, F 104, F 11, F 12, F 15, F 18, F 19, F 2, F 20, F 21, F 22, F 24, F 3, F 31, F 32, F 34, F 4, F 49, F 5, F 50, F 51, F 52, F 6, F 63, F 64, F 65, F 67, F 68, F 69, F 7, F 8, F 80, F 88, F 9, F 90, F 91, F 92, F 93, F 94, G 1, G 10, G 104, G 105, G 11, G 112, G 13, G 2, G 22, G 29, G 3, G 30, G 32, G 35, G 4, G 7, G 8, G 82, G 9, G 91, G 92, G 93, G 94, H 18, H 29, H 36, H 37, H 38, H 39, H 81, H 82, H 87, H 89, H 98, I 185, J 60, J 8, J 82, J 9, K 103, K 116, K 117, K 162, K 163, K 24, K 29, K 39, L 101, L 103, L 104, L 105, L 106, L 107, L 108, L 109, L 110, L 114, L 116, L 117, L 118, L 119, L 120, L 121, L 122, L 125, L 126, L 138, L 162, L 163, L 9, M 101, M 104, M 105, M 106, M 113, M 114, M 115, M 116, M 144, M 171, M 183, M 184, M 185, M 192, N 118, N 172, N 195, O 141, O 158, O 159, O 166, O 167, O 173, O 174, O 175, O 181, O 186, O 187, O 192, O 193, O 195, O 199, P 113, P 114, P 120, P 138, P 139, P 159, P 164, P 169, P 198, P 281, Q 128, Q 162, Q 172, Q 173, Q 182, Q 195, R 122, R 123, R 130, R 131, R 132, R 133, R 148, R 168, S 170, S 171, T 106, T 20, T 62, U 138, W 118, W 120, W 129, Y 130, Z 195, Z 199, Z 49, Z 55.